The duo have been made unavailable after all-rounder Stokes was arrested in Bristol in the early hours of Monday following England's 124-run win in the third ODI on Sunday. 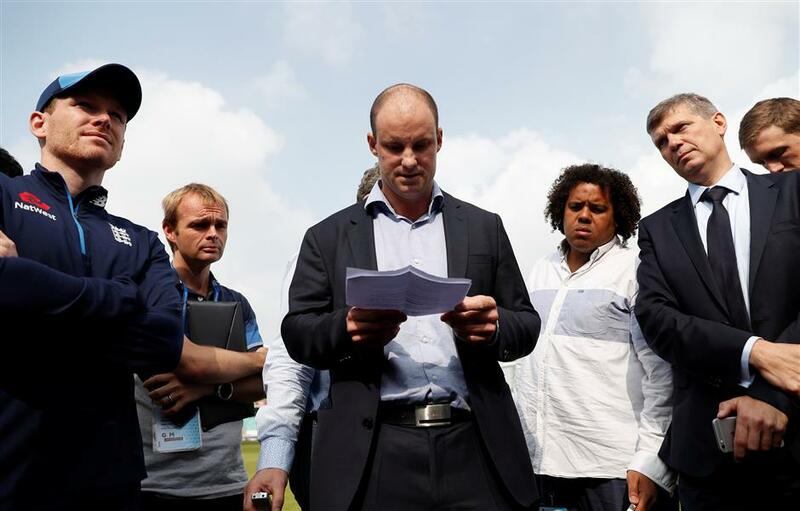 England and Wales Cricket Board (ECB) director of cricket Andrew Strauss speaks to the media as England one-day international captain Eoin Morgan (left) looks at The Oval in London on September 26, 2017, on the eve of the fourth ODI against West Indies. England has dropped Ben Stokes and Alex Hales from its side to play West Indies in the fourth one-day international at The Oval on Wednesday following Stokes's arrest, the England and Wales Cricket Board announced on Tuesday. The duo have been made unavailable after key all-rounder Stokes, 26, was arrested in Bristol in the early hours of Monday morning following England's 124-run win in the third ODI in the southwest city on Sunday. Hales, 28, was with Stokes when the incident happened in the Clifton district of Bristol on Sunday night. The Oval match takes place just hours after England is due to unveil its squad for the Ashes tour of Australia at the south London ground on Wednesday. "Ben Stokes and Alex Hales will not be available for tomorrow's one-day International match against West Indies at The Oval," ECB director of cricket Andrew Strauss said while reading out a board statement to reporters at The Oval on Tuesday. "Stokes was arrested in the early hours of Monday morning, 25 September, following an incident in Bristol," the former England captain added as he continued to read out the statement. "He was held overnight and released under investigation — without charge — late on Monday and will not join the team in London. "Hales, who was with Stokes on Sunday night, did not train this (Tuesday) morning and has returned voluntarily to Bristol today to help police with their enquiries. "You will understand that we cannot offer further details at this stage but will provide any updates when we can." Strauss confirmed that both Durham star Stokes — a test regular — and Nottinghamshire batsman Hales, a fringe candidate, will be considered for the Ashes squad on cricketing grounds alone by the England selectors at this stage. Meanwhile, a statement issued by Avon and Somerset police said: "We were called to a disorder in Queens Road, Clifton, at around 2:35am on Monday. "A 27-year-old man was found to have suffered facial injuries and was taken to the Bristol Royal Infirmary for treatment. "A 26-year-old man was arrested on suspicion of causing actual bodily harm and has since been released under investigation." The police statement asked anyone who was in the Clifton Triangle area in the early hours of Monday "who saw any part of this incident" to contact them.